Attending this event definitely had me see my past self. I know I've talked about it here and there that I used to be a chemistry major in college, before shifting to management. In my time at the chemistry department, I did see the struggles of women in the industry. As far as UP Chem is concerned, there was definitely no sexism, and the community was fair. Some science departments actually even had more female scientists in them. But there were plenty of sacrifices made by the female scientists. Some ended up not marrying altogether to pursue their careers. We had this professor who brought her baby to school. And for a lot of those who had children, they did feel some guilt that their intensive careers ate away at their family time throughout the years. With all these sacrifices and hardships of women in science, they ought to be recognized, appreciated, and supported in their endeavors. 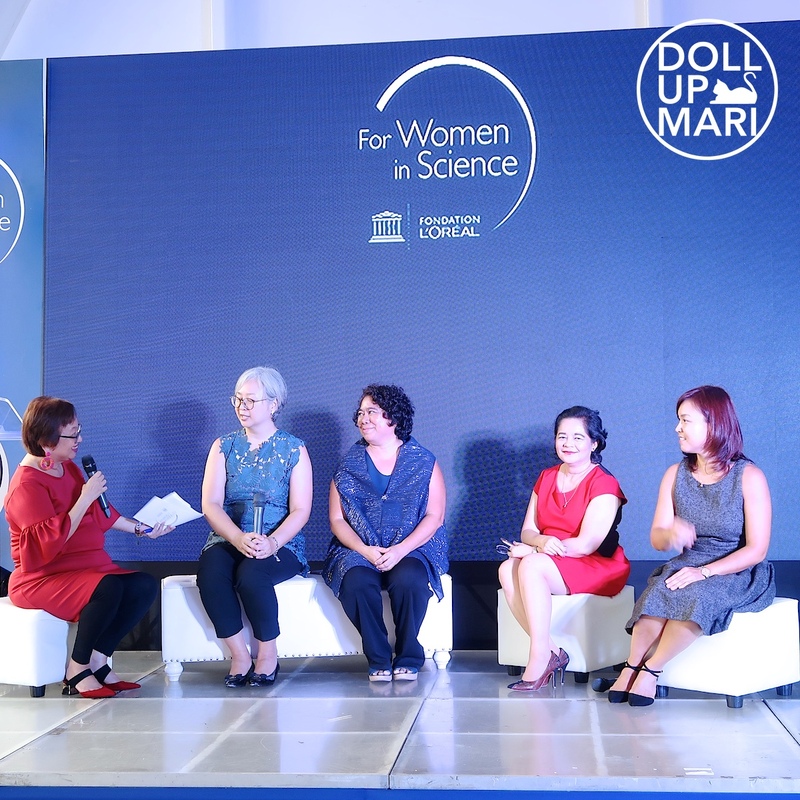 This is exactly what L'Oréal's For Women In Science initiative is all about. 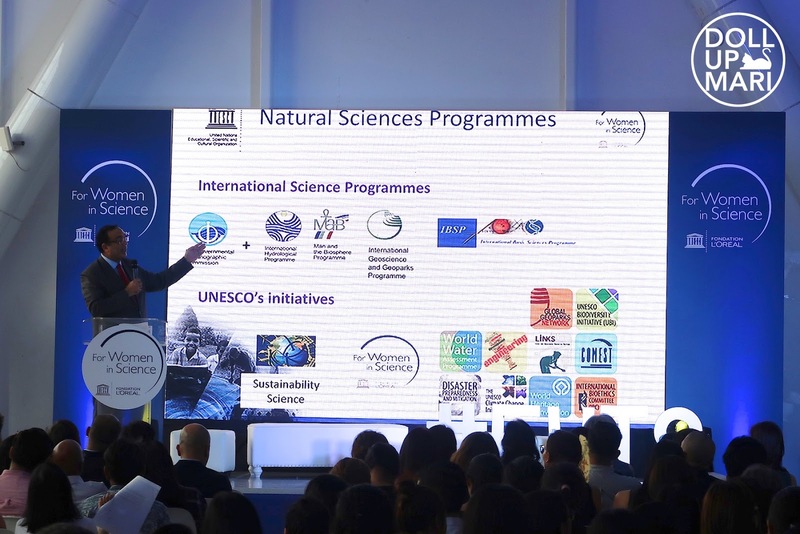 This is their partnership with UNESCO since 1988, and the program has helped more than 2,700 women across 115 countries and awarded grants to 97 Laureates. Shahbaz Khan, UNESCO Science Bureau for Asia Pacific gives a talk on the big problem of leaky pipelines. This refers to women not making it further in their education to pursue PhD's. After college, only a handful go on to purse a masters degree, and even fewer go on to pursue a PhD. A lot of the talent gets "leaked" out along the way, and oftentimes, it's due to the pressures of marriage, starting a family, and the like. The new challenge is the fact that even just at the high school stage, less and less girls choose to pursue science and engineering tracks for college, furthering the leaky pipeline problem. 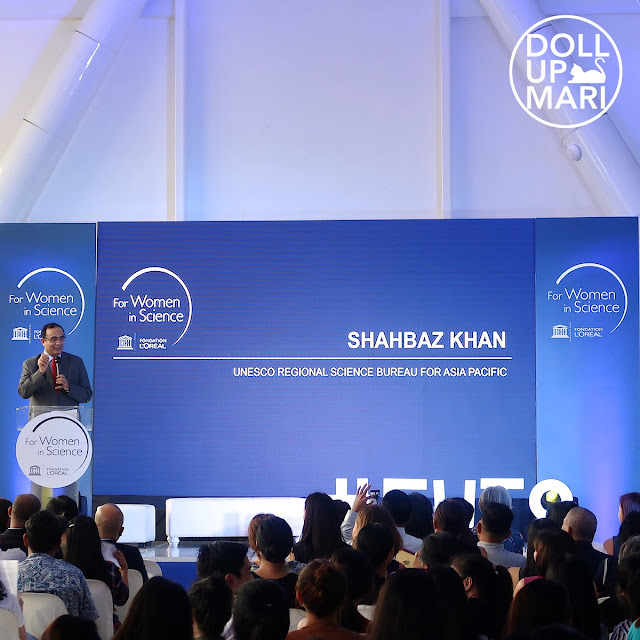 To combat this phenomenon, Prof. Khan explains many of the programs and initiatives in place to support scientists in general, especially women scientists. After Prof. Khan, Dra. 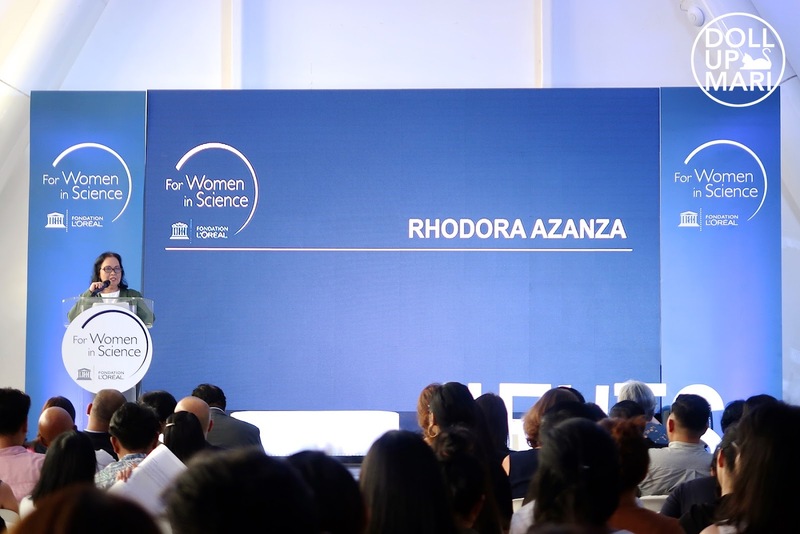 Rhodora Azanza, president of National Academy of Science and Technology gives a word on the initiative. She is a member of the jury for the selection of the 2018 National Fellow. 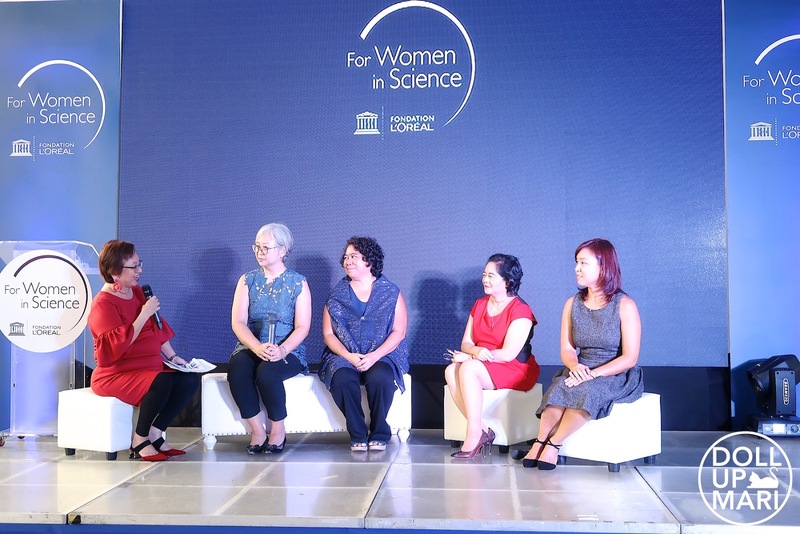 They then call on the panel of women scientists to discuss opportunities for the future, as well as to share some of their own personal experiences on how they were able to become successful figures in science. There is Dr. Ma. Mercedes Rodrigo (Author of "Women in Science" children's books), Dr. Laura David (FWIS 2011 National Fellow), Dr. Marieta Sumagaysay (Executive Director, National Research Council of the Philippines), and Dr. Aletta Yñiguez (FWIS 2012 National Fellow). 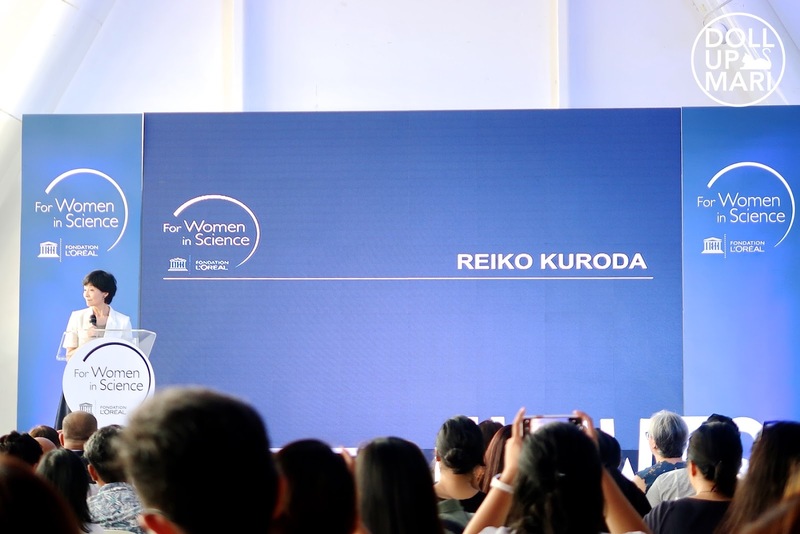 Dr. Reiko Kuroda, FWIS 2013 Global Laureate for Asia Pacific was also gracious enough to come over and to talk about her research, as well as to give inspiration to the guests. Dr. Kuroda is world renowned for her study on snail shell chirality, and how one single gene can twist the snail's shell. It was previously thought that mirror image snail shells came from mirror image embryo development. Dr. Kuroda's research on Lymnaea stagnalis showed that the chirality was actually determined even much earlier than thought, earlier than the development stage. That it was at the genetic stage. This whole study of chirality's impacts on genetics has helped advance Alzheimer's disease research and has the potential to advance many other studies in medicine. Dr. Kuroda's team has continued their research and is looking into which gene causes the chirality in snail shells. And the next question is: what was this gene destined to do? Like if it was there to dictate if a snail is right shelled or left shelled, why does it need to do so? And most importantly, Dr. Kuroda is on a crusade to show that women's talent should be appreciated. In her time as a young scientist, the norm all around her was to give up working and to marry and have a family. Her own supervisor in Japan told her that she should get married! She went to the UK to further her career instead. Fast forward to today, she wants to be the role model for girls to emulate, because if girls have no women scientists to look up to, they won't have a target to emulate. I was not able to stay for the whole ceremony, so for those who wish to know who is FWIS 2018's National Laureate, it was Dr. Charissa Ferrera! You can read about it in a past post. And yaaaay, selfie with Shai!